Vic and Pam, his bride since 1978, served with Christian Missionary Fellowship for the last twenty years before coming to South Lakeshore. Vic and Pam served in Chile from 1995 to 2009 as church planters and worked in leadership development. From 2010 they worked in Mexico City where Vic focused on training church leaders and Pam worked with CHE (Community Health Evangelism). Vic’s undergraduate work was at Northwest Christian College (now Northwest Christian University) in Eugene Oregon with a B.A. in Cross-Cultural Ministries. His graduate work was at Western Seminary in Portland Oregon graduating with an M.A. in Intercultural Studies. Vic is currently enrolled in the doctorate program at Western pursuing a Doctorate of Missions in Intercultural studies. 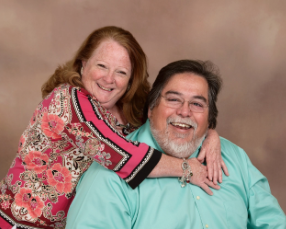 Both Vic and Pam came to Christ as adults ten years into their marriage. Vic served the Navy for ten years, worked as an electronic tech and postman before going off to college to prepare for mission service. Pam worked at home raising the children, holding the fort when Vic was at sea and worked in a nursing home to put food on the table while Vic was at undergraduate school. They have two sons, one daughter-in law and two grandsons. Pam is a dachshund fanatic and while Vic loves them too, he is a self-professed cat person.